HeLi-on, the solar charger for your pocket! The infinityPV HeLi-on is the world's most compact solar charger. It fits into your pocket, and the solar panel can be rolled out when needed. Inside HeLi-on there is a powerful solar panel and a battery, so it can both generate and store energy. The HeLi-on charger combines three key components into a single product: A large energy collecting solar panel, an energy storage battery bank, and efficient electronics. All features are combined in a slick and light design for convenience. HeLi-on will let you charge your smartphone in 2-3 hours* whenever and wherever you need. You can charge an external device in two ways with HeLi-on: Either unroll the solar panel and charge directly from sunlight or use the internal battery when the sun is down. The internal battery can be charged either with the solar panel or with any USB charger. The HeLi-on charger is compatible with any device charging through USB, including: Smartphones, flashlights, cameras, portable game consoles, walkie-talkies, etc. The world's most compact solar charger? When we say that HeLi-on is the world's most compact solar charger, we mean it! HeLi-on measures just 11.3 x 3.6 x 2.8 centimeters and weighs 105 grams. HeLi-on is powered by a flexible solar cell foil made by infinityPV. The solar cells themselves are less than 2 micrometer thick, but encapsulated in a protective foil on both sides. This brings the total thickness of the solar panel to less than one millimeter. Starting at $90 including shipping ($85, for early birds) HeLi-on is competitively priced. We offer HeLi-on in two versions: the base version in white available at $90 and at $100, you will get a HeLi-on with free color selection. Currently we offer blue and white as color choices, but we intend to expand this selection as stretch goals. Please notice that all prices includeDanish VAT (25%) and international shipping. We also offer double and ten packs of HeLi-on. Our last reward is the "come and meet us" package including 5 HeLi-ons. As a special reward, we have made a postcard-sized solar panel that demonstrates our technology. As a last reward we offer our postcard sized solar panel. The panel can power small electronics projects and is a demonstration product for the technology. If you would like just the postcard panel, we've got you covered at $15 if you would like a postcard solar panel in addition to HeLi-on just add $10 (70DKK) to your pledge. Inside HeLi-on you find polymer solar cells produces by infinityPV. Polymer solar cells are part of the third generation of solar cells, also referred to as organic solar cells. The light absorbing active material is carbon based, and the entire solar cell is made with renewable and non-toxic materials. The solar cells are printed directly on thin plastic foil using optimized printing machines. We chose polymer solar cells for HeLi-on, because they are the only technology that is sufficiently thin and rollable to fit. Our solar cells are colored, partly transparent, light-weight, shatterproof, and rollable. Their flexibility introduces new design options, and the design of HeLi-on is an almost intuitive extension of the properties of the solar cells. Inside the HeLi-on charger, we have placed a lithium-ion battery with a capacity of 2,600 milliamp hours. The capacity of this battery is comparable to most current smartphones (163% of iPhone 5s, 139% of iPhone 6, and 92% of iPhone 6+). HeLi-on is designed to get the best charging efficiency at all times and all weather conditions using custom-made maximum power point tracking electronics. The electronics ensures that the full potential of the solar panel is used to charge the battery or power an external device at any time. HeLi-on also has a LED charge indicator showing the battery level. The flexible solar panel inside the HeLi-on is developed and produced by infinityPV in Denmark. We are proud to create a device that highlights the advantages of flexible organic solar cells and places them in an everyday product. infinityPV ApS is a Danish start-up company founded in 2014 with Frederik C. Krebs as its CEO. The core technology of infinityPV is printed electronics and in particular printed organic solar cells. infinityPV is based on several patents within the field of organic solar cells and holds a wide range of competencies in this area. Our experience in large-scale printed organic solar cells is derived from years of success in scientific research and development. So far, the team has fabricated kilometers of solar foil in different designs. With chemists, printing engineers and electronic engineers on hand, we can react quickly to changing requirements and design variations. Since we launched the company, we have worked to commercialize organic solar cells by supporting research, but also selling solar cells directly to consumers. In 2015, at the Royal Society of Chemistry Emerging Technologies Competition we won the second place with our scalable solar cell technology. 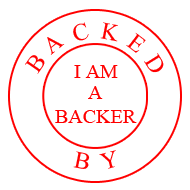 The Kickstarter team is compriced of Berenger, Markus, Martin, Francesco, Thue, Michael, Michail, Morten, and Frederik from infinityPV. Morten V. Madsen is an infinityPV co-founder and is heading the Kickstarter initiative. Morten has a PhD degree in polymer solar cell degradation and stability and has worked within the field for 6 years as a scientist at the Technical University of Denmark. Morten has worked to disseminate knowledge on polymer solar cells and has produced the Coursera course "Organic Solar Cells - Theory and Practice" and a long list of videos covering related topics. In addition, Morten is co-author of 20 peer-reviewed publications and has worked with rapid prototyping, manufacture, and design. Frederik C. Krebs is the CEO of infinityPV, a professor at the Technical University of Denmark, and a world-renowned scientist, recognized as one of the world’s most influential scientific minds. Frederik has been spearheading the development of polymer solar cells and has been awarded with the EliteForsk award, the DFF Advanced Grant for excellent researchers, and theGrundfos prize. When Thomson Reuters highlighted roll-to-roll processed polymer solar cells as one of 100 key research fronts, they wrote: "Frederik Krebs is the author of a remarkable 31 of 35 core papers in this highlighted research front. (...) These data clearly demonstrate the central position of Krebs in research on roll-to-roll processing of polymer solar cells."